Jingkai “Barnett” Zhou, a student from China, enjoys interacting with his classmates at Bishop Ludden Jr./Sr. High School. It’s hard to believe that Jingkai Zhou is just 13 years old. 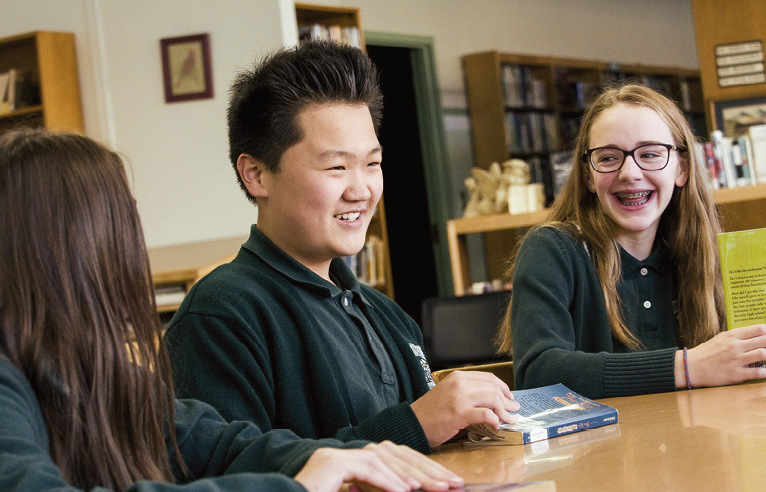 Thousands of miles away from his home in Shanzi Province, China, this 7th grader, who likes to be called Barnett, has an unusual maturity as he navigates a new culture and educational experience at Bishop Ludden Juinor/Senior High in Syracuse. Barnett applied to 10 American schools last summer. He decided to attend Bishop Ludden when he saw it was well regarded academically and because he was eager to experience New York State. He admits he pictured more of a New York City atmosphere before he arrived, but he has quickly come to appreciate the suburban lifestyle of his host family George and Brenda Marshall, who live in nearby Fairmount. 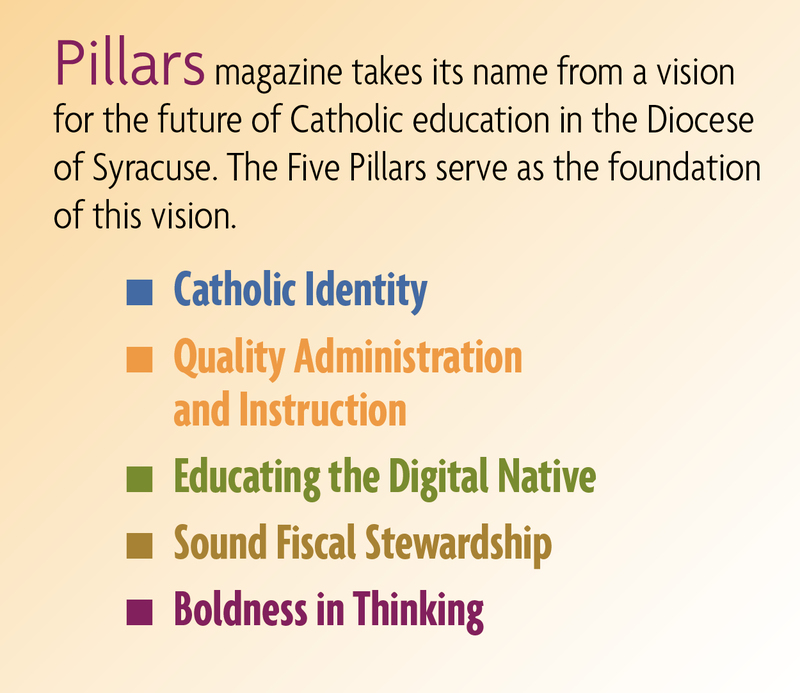 Barnett is one of the youngest of several dozen students who attend the four Catholic junior/senior high schools in the Syracuse Catholic Diocese. The students come from various countries, including China, Vietnam, So. Korea, Egypt and Ghana, and are found through educational placement agencies. The diocesan high schools have been eager to draw students from around the world in an effort to give their own students exposure to other cultures and boost enrollment. The international students are eager for the opportunity, as well, as they are exposed to a new culture and believe their educational experience in the U.S. will enhance their chances of admission to some of the most competitive American universities. While Barnett admitted his parents and sister were “sad” to see him go so far away, he knows they are very proud of his intention to receive an American education. Already he has his eye on Harvard, Stanford and Berkley, where he hopes to study computer science or engineering. “I plan to return to China after college,” said Barnett, who explained that an American education is considered “elite” in China and almost guarantees a good job and a bright future. He is well on his way. The 7th grader current­ly takes 9th grade algebra, his favorite subject, although he acknowledges that English class continues to be his biggest challenge. Religion class was something completely new to him, as his family does not practice any faith. Still he looks at it as a kind of social experiment. “I don’t know anything about the Bible, but one of the reasons I chose this school was because religion is such a part of the American culture, and I want to learn more about that,” he said. 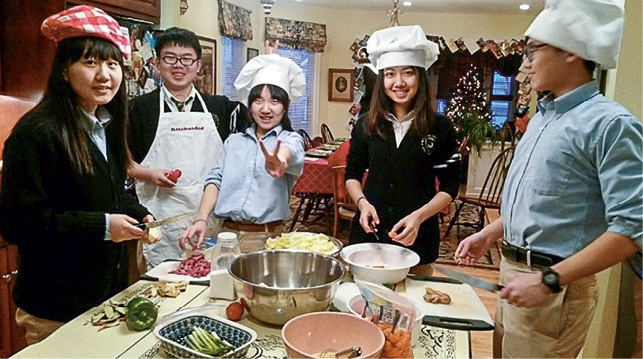 International students at Notre Dame prepare a traditional Chinese dinner. Pictured, left to right, are Freya Gao, George Zhou, Amy Zhang, Linda Yang and Ness Guo. One of the biggest adjustments for Barnett has been having free time in his schedule. In China, he went to school for eight hours a day, did homework for another three hours, and then, in preparation for coming to the U.S., studied English for another five hours. “As a 6th grader, I slept an average of five hours a day,” he said. Barnett has filled that extra time in the U.S. with friends and activities. He said he know almost everyone in Bishop Ludden’s 7th and 8th grades and is “pretty thankful they accept me.” He has immersed himself in robotics and chess clubs and was even elected class treasurer this year. His greatest love, however, is basketball. “We watch a lot of NBA in China,” said Barnett, whose favorite team is the Golden State Warriors. I love basketball because of the teamwork. Does he play basketball, too? Unfortunately, it doesn’t love me back!” he said with a laugh. Bishop Ludden Principal Brenda Reichert keeps track of Barnett and all of the international students to make sure they are doing well and adjusting to the school environment. She enjoys having the international students as a part of the student body and hopes to bring in students from other countries in the future. Unlike Barnett, Fangyi Yang, who goes by Linda, has been in the U.S. for three years attending Notre Dame Junior/Senior High School in Utica. She is one of a number of students who attends the school and has become immersed in the daily life of an American teenager. For the past two years, Linda has lived with the McCoy family, Ken, who is the CFO of Notre Dame Schools, his wife, Tammy, and their two daughters, age 12 and 14. Linda enjoys her classes at Notre Dame and is not bothered by the faith-based curriculum. “My family’s belief is Buddhist, so it is not difficult for me to attend a faith-based school. By the knowledge I gain in religion class, I find every religion has some similarities to each other. They are all good, and I respect all religions,” she said. She will graduate in June from Notre Dame and is planning to attend an art college and major in graphic design, following in the footsteps of her father, who is a designer in China. The McCoy family has assured her she will always have a home-away-from-home during college breaks.